There are rumours of Manchester City being interested in signing a centre-back (Pepe to be precise) as Joleon Lescott seeks more playing time before the World Cup which may not be possible at City due to the meteoric emergence of Mataja Nastasic. But there’s one player who may well compete for the starting spot in the central defence in the upcoming years, Karim Rekik. Rekik is well known in the youth circuit and is rated as one of the most promising player from City. being named on the bench in 8 matches. He made his Premier League debut in December when he started against Reading in a 1-0 victory, again occupying the Left back spot. Currently he is at PSV Eindhoven on loan and produced a match winning performance against Fenerbahce in 2-0 in the recent friendly, starting at his natural centre-back position. Rekik is a regular member for the Netherlands Youth national team. 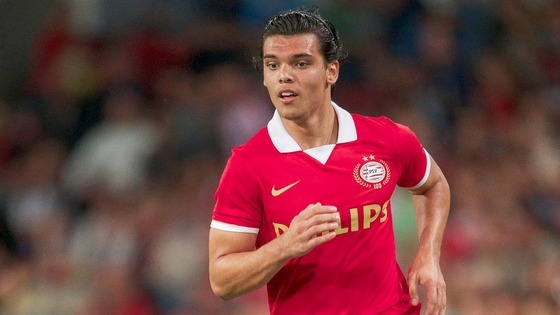 Infact, Rekik captains the Netherlands U19 squad. He had to withdraw from the U19 Euros because of his loan spell at PSV. In his own words,Rekik’s natural position is centre-back but he can cover up the left-back spot whenever needed. Rekik has been/is the captain of Feyenoord youth, City reserves and the Netherlands youth national team. Despite his young age, he has already acquired some handy experience. Standing 6 foot 1 inch tall, Rekik uses his height to good use. He is very strong in the air and we can expect some power headers from him in set piece situations. Being robust, he is very difficult to push off the ball. Rekik is extremely confident possession and he showed his rich variety of passes in the recent friendly against Fenerbahce. He can read the game very well and has brilliant anticipation and intercepting skills to handle any Strikers next move. Rekik is well composed in any situations but at the same time does not shy away from sliding in a tackle. He is always there to challenge for ground or aerial 50/50 and his leadership qualities can be seen in the way he conducts himself on the pitch. He positions himself well and it won’t be surprising to see him in the City squad by next season itself. Rekik is the only left footed centre-back at PSV and with the highly rated Jetro Willems at left-back, Rekik will get to play at his preferred position more often. The loan spell at PSV is a very good platform for Rekik to announce himself and to gain more experience from playing at the top level. There’s no doubt Rekik will come out as a more developed player at the end of this loan spell. Rekik said he wants to represent Netherlands at the 2014 World Cup, It maybe a too high target to achieve in such less time but no denying this young lad will be the first choice centre back for Netherlands and City very soon. Click on Sid’s name to follow him on Twitter and check out typicalbluemoon.wordpress.com for more of Sid’s work.